3-way thermic loading valve for solid fuel/storage tank installations. The valve is intended to ensure both an optimal temperature stratification in the storage tank and a high return temperature to the boiler, thus in - cresasing the efficiency of the system. Female thread DN25 (1"), 61°C, Kvs 9 m³/h. We don't sell the LK Armatur products to outside of Estonia! Tarring and condensation are prevented which prolongs boiler life. LK 820 can be equipped with an insulation. The valve can be mounted at any angle. 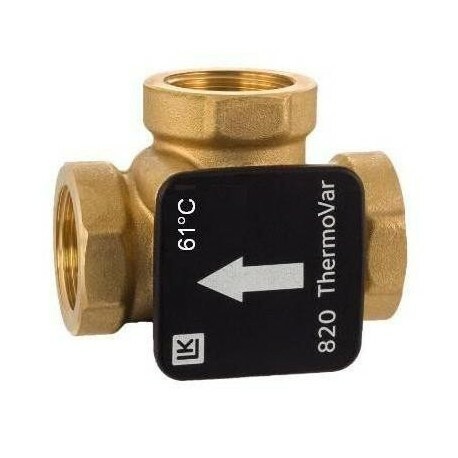 LK 820 ThermoVar can easily be adapted for right- or left-hand mounting. The valve can be installed in three different positions.